When starting kubuntu with a small screen so the netbook settings are used and then switching to plasma-desktop, the shortcut fo kmail in the favourites tab of kickoff has no icon and cannot launch kmail2 as it tries to launch kmail(1). You need to search for kmail2 in the applications tab to start it. This can be fixed by pointing the entry in the favorites list to kmail2 instead of kmail. 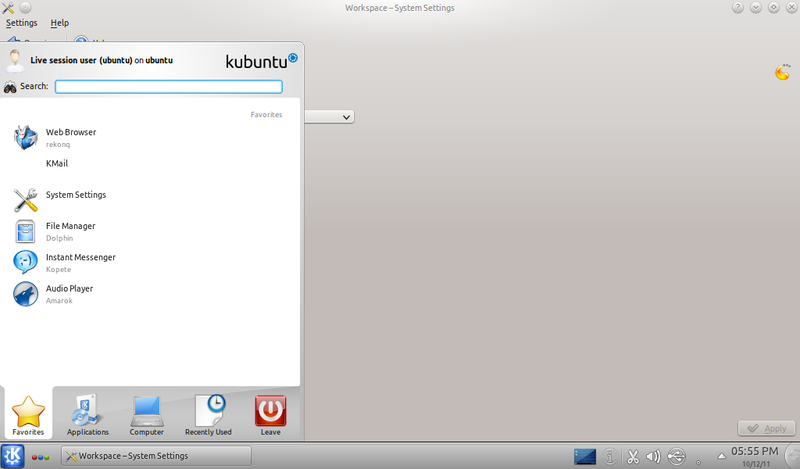 2) go to system settings -> workspace behaviour -> workspace and switch the workspace type to desktop. 3) open kickoff and you'll see the broken entry for kmail. 5) start a new netbook user session and repeat steps 2-3, you should see the working kmail2 entry now. The fix only touches that one entry, and it can't really get anymore broken than it currently is. kickoffrc in kubuntu-netbook-default-settings needs to be fixed. Accepted kubuntu-netbook-default-settings into oneiric-proposed, the package will build now and be available in a few hours. Please test and give feedback here. See https://wiki.ubuntu.com/Testing/EnableProposed for documentation how to enable and use -proposed. Thank you in advance! * Fix Kickoff showing a broken entry for Kmail instead of Kmail2. I totally forgot about this. Tested and works.